Adam Langer, the wickedly funny author of the novels Crossing California, The Washington Story, and Ellington Boulevard, has written a book that is at once a comical literary caper, an exploration of authenticity and fakery, and a tribute to books. 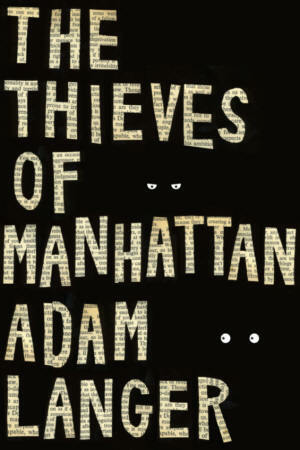 THE THIEVES OF MANHATTAN is a novel that examines the lengths some writers will go to succeed. Aspiring writer, penniless barista, and self-described sullen mope, Ian Minot is perturbed by the literary success of his Romanian girlfriend. His annoyance turns to rage as he sees what he believes to be a fabricated memoir by two-bit thug and music business hanger-on, Blade Markham, shoot to the top of the bestseller list. Ian proves to be an easy mark for Jed Roth, a suave book editor with an ingenious and nefarious plan: if Ian revises a thriller Jed wrote years ago and gets it published as his own memoir, they’ll both have a platform from which to humiliate Blade Markham’s agent and publisher and Ian will finally be able to find a publisher for his own short fiction. As Ian rewrites and shops around his “memoir,” he finds himself facing a myriad of challenges, adversaries, and curiosities (on the page and off), including a hooligan librarian, a foul-mouthed manuscript appraiser, a members-only library and a priceless copy of the world’s first novel. As his elaborate hoax progresses, Ian finds himself wrapped up in the hypocrisies of a culture that values success above all and realizes the ways in which fact and fiction are inexorably intertwined. With cameos by real-life denizens of the publishing world and dozens of entertaining literary references, THE THIEVES OF MANHATTAN is an original, hilarious and provocative novel.